Returning to civilian life after the service in the military is a challenge every veteran must face. In many cases, this challenge is added with both physical and psychological wounds – the legacy of the warfare experience. Administration (VHA) provided a number of alarming findings. 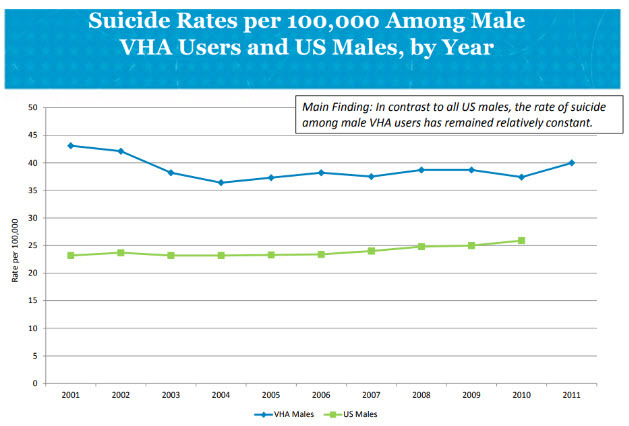 For example, suicide rates among veterans continue to soar. In this article, we are going to discuss the findings of this report and identify critical issues facing veterans along with helpful resources. Similar findings were discovered in females. 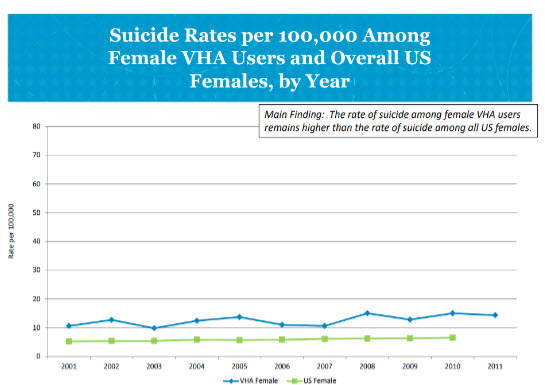 Although the rate of suicide among females remain lower than in males, veterans still commit more suicides than the general U.S. female population. These findings are shown in the graph below. Many resources are available for veterans and their families to help them with coping in difficult situations.  Veterans Crisis Line. Qualified and caring responders from the Department of Veterans Affairs are available for help using a confidential toll-free hotline, text, or online chat.  National Suicide Prevention Lifeline. A 24/7, confidential, and free support and crisis and suicide prevention resources. For the most veterans, postwar life means loneliness. The people they served with focus on their civilian lives and don’t really have time for regular meetings. Establishing friendships with civilians is also very difficult because of profound disconnect between the returning military personnel and civilians. Some veterans join clubs and groups to feel the sense of belonging to a group. For example, they start writing courses and get essay tips from civilian writers. In some cases, they choose to create content for living.  Veterans of Modern Warfare. The mission of this organization is to provide education and information about veteran benefits, emotional support, healthcare, advocate veteran groups, and help with transition to civilian life.  Vietnam Veterans of America. Assistance with getting veteran benefits and jobs, support groups, financial assistance, and community of Vietnam veterans. 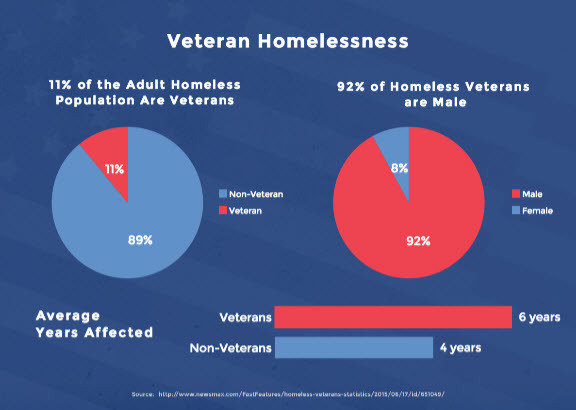 According to the data provided by the National Coalition for Homeless Veterans, about 11 percent of the adult homeless population are veterans (see related data in the graph below). Many of them suffer from mental illness and/or substance abuse. Also, about 20 percent of veterans currently in substance abuse treatment facilities were homeless.  Substance Abuse and Mental Health Services Administration. It offers grant programs and services that assist veterans in their transition from homelessness as well as provide medical treatment for mentally ill.
 National Coalition for Homeless Veterans. The organization provides various homelessness programs, events, and treatment courts. the involvement in combat, injuries, relocations, and even sexual violence. As the result, all that emotional pain continues to take a heavy toll on mental health. However, only one out three veterans look for professional assistance.  National Center for PTSD. Qualified help for veterans who have PSTD and their families.  Wounded Warrior Project. Combat Stress Recovery Program and other events.  Real Warriors Campaign. A project launched by the Defense Centers for Excellence for Psychological Health and Traumatic Brain Injury provides support for veterans struggling with PTSD and other mental issues. According to the statistics provided by the National Coalition for Homeless Veterans, there were around 140,000 veterans held in state and federal prisons. They are 99 percent male and their median age (45) is older than of the general prison population (33). There are more alarming facts: more than 50 percent of veterans commit violent crimes and they have longer average sentences than non-veterans.  A Veteran’s Guide To Criminal Law. Provides helpful knowledge such as how to get an attorney, what to do if in the custody, and other explanations.  U.S. Department of Veterans Affairs. Benefits and programs for incarcerated veterans and other information. might be facing serious issues that decrease the quality of their life. Tom Jager is professional blogger. He works at Proessaywriting. He has degree in Law and English literature. Tom has written numerous articles/online journals.